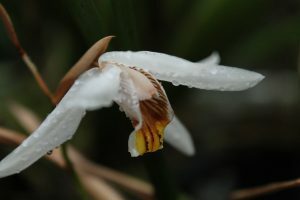 The greenhouse is full of Coelogyne species in bud that will fill the greenhouses with flowers later in the spring and the first, Coelogyne viscosa, has opened its first flowers today. We have seen this species in the wild near Tad Fan waterfall on the Bolevan Plateau in Southern Laos. This habitat is relatively cool forest at 1400m altitude with warm wet summers and a cool dry season in the winter and a hot dry season in spring. We grow the plant in Cool Asia and sometimes give it a spell in Warm Americas for a little extra heat. The species is bee pollinated like most Coelogynes. 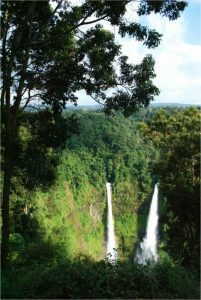 Tad Fan waterfall photographed on one of our expeditions to Laos. There will be more orchids from this habitat featured later in the year when they flower.